We , human beings always have a special affinity with our "firsts"..be it our first day in school/ college , first flying experience , first time eating a exotic dish or our very first bake.We always hold onto that experience/memory with ferocious intensity and even let it dictate our emotion years later If you guys got the hint and made the connection, pat yourselves on the back. Yes, Cornbread was my first solo bake and it's success lured into further baking pursuits. If someone were to ask my friends back in NY about my signature bake, corn bread would unanimously win. It would always turn out soft and scrumptious ...so many memories of enjoying it in the company of friends on a chilly day with hot steaming cups of tea..just plain divine would be how I would describe it. If you have been following my blog, the fact that I am currently obsessed with Mexican cuisine wouldn't have escaped your notice. So,what better way to pay tribute to it than to bake Mexican cornbread. As I mentioned earlier I have baked cornbread before but mine was a sweeter version. Did a little research which enlightened me to the fact that the Mexican version is less sweet and generally flavored with jalapeno peppers , olives and cheese. Traditionally, corn bread is made in a skillet and there are many recipes but the one I adapted from comes from Rick Bayless. As always, I took liberty to add/omit some ingredients according to my family's taste but the result was nevertheless excellent . Would highly recommend it if you are looking for a change from the usual breads. Preheat the oven to 425 degrees Fahrenheit . Also, grease a 9 inch baking dish . Chop the jalapeno peppers and olives . Next , drench or coat them in all purpose flour to ensure that they don't sink to the bottom of the bread while baking. Take a large bowl and sieve all the dry ingredients - cornmeal, flour,baking powder, baking soda, sugar and salt. You can also whisk them together to ensure aeration. In a separate bowl , mix the eggs with the milk and buttermilk. To make buttermilk, I simply added 2 1/2 tbsp of powdered buttermilk to 2/3 cup of water . You can also make buttermilk by adding 1 tbsp of vinegar or lemon juice in 1 cup of milk and letting it stand for 10 -15 minutes. 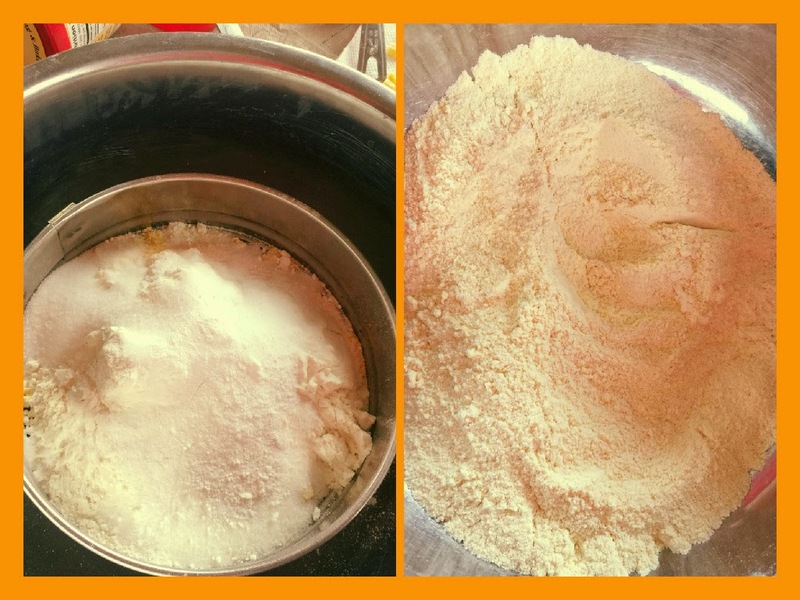 Now add this egg mixture to the sieved dry ingredients (flour mixture) and gently stir till incorporated. 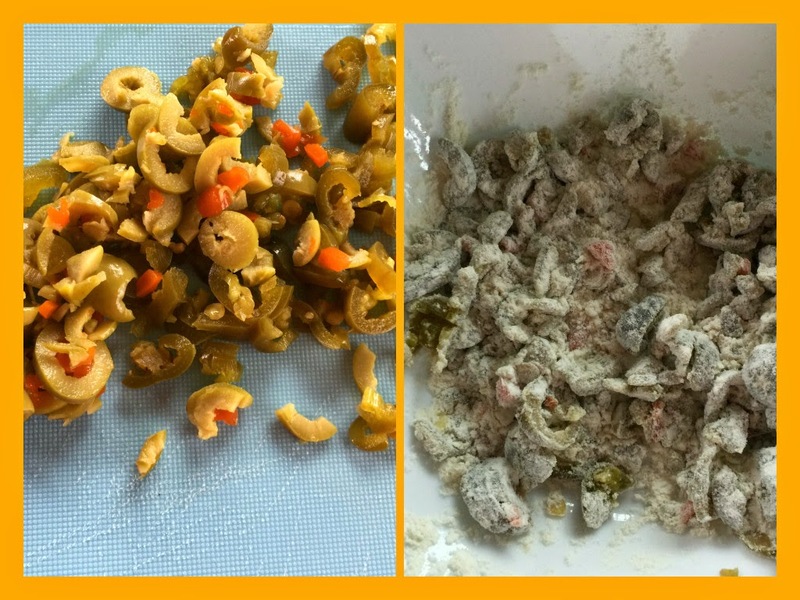 Fold in the melted butter ,cheese , chopped jalapenos and olives as well as 3/4 th of the corn kernels. Take care as to not overmix. Transfer to the greased baking dish and sprinkle the remaining of the corn kernels on top. Bake it in the oven at 425 degrees Fahrenheit for about 20 minutes or until a tooth pick inserted comes out clean. Cover the top with aluminium foil if you find it is browning too quickly with the radiant heat. Remove from the oven ,cool on a wire rack , cut into squares and enjoy !